A while back I had mentioned various yeast strains we have been trying and I'd like to elaborate further on our results. We first started our pilot batches using the Wyeast 3724 which is the Saison Dupont strain. This strain is notoriously finicky and after several batches, only one of which attenuated down to the single digits, we abandoned that approach in favor of a multi-yeast fermentation. There has been speculation that Saison Dupont uses a mixed strain fermentation so this was our way of trying to replicate that approach. We then began doing small fermentations to assess the organoleptic qualities of various yeast strains. Some contenders were Fermentis T-58 (Chimay variant), WLP550 (Achouffe), Lallemand 71B (wine yeast), and Lallemand Assmanshausen (wine yeast). My goal was a blend in which the Dupont strain was dominant and the other strains playing a secondary role. My other goal was a blend that was repeatable and didn't require a large investment in propagation equipment to maintain multiple pure strains. The blend we eventually came up with was a Dupont/Assmanshausen/T-58 blend. This required the ability to keep a pure culture of the Dupont strain since this strain is only available in liquid form. And since the other two strain are dry yeast strains, there is no need to maintain these cultures. They also have complementary characteristics. The Dupont strain is a fast starter and will dominate the first 48 hours of fermentation as the temperature rises to the high 70s. The Assmanshausen strain takes 36-48 hours to acclimate and begin fermentation and will take off just as the Dupont strain is stalling out. Also, being a wine yeast, it likes higher fermentation temperatures. One drawback to this strain is its inability to ferment maltotriose so a small amount of T-58 helps to clean up at the end of fermentation. Our results with this blend were very good despite being somewhat cumbersome. 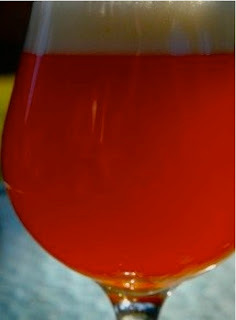 One strain I was rather resistant to try was the Wyeast 3711 French Saison. I eventually did and was impressed with the results. I will tell you more about that next week. I attended the Rocky Mountain Microbrewing Symposium last week. This was my first time going to this yearly event and it was a good refresher of information I had learned at Siebel. What really piqued my interest was a presentation by Bob Sclafani on called 'Yeast and Civilization'. This presentation contained one piece of information about some Belgian yeast strains that was completely new to me. Over time yeast strains have been classified and reclassified over and over again. In the case of lager yeast, it has been called Saccharomyces carlsbergensis, S. uvarum, S. cerevisiae var. carlsbergensis, and now apparently S. pastorianous. Over the past few years the genomes of some yeasts have been mapped and this has brought to light new information about the origins and hybridizations of yeasts strains, and yet more new classifications. What is especially striking is the origin of some Belgian yeast strains. What had always been thought to be just another variation S. cerevisiae is actually a hybrid of S. cerevisiae and a more ancient yeast S. kudriavzevii. How could this hybridization happen? Although brewing yeast reproduces by meiosis or asexual reproduction under normal conditions, under stress can form spores and reproduce sexually. Think of it as a self defense mechanism. If the yeast is in danger of perishing due to a hostile environment, it sporulates in hopes of preserving it's genetic make-up. Since most fermentations in Belgium were mixed fermentations of various yeasts and some organisms that produced lactic and acetic acid, this may have been perfect environment for this hybridization to take place. How did S. Kudriavzevii get in there? It's possible that it could have been naturally in the environment. Another possible source is oak barrels, or more specifically oak bark where this species has been isolated. This makes sense, normal variations of S. cerevisiae do not account for the unique properties of most Belgian yeast strain and this information helps shed light on why. Why Saison? From a personal perspective, the Saison style has fascinated and perplexed me for years. Before we examine why, we need to examine what is a Saison. With most Belgian styles you can map out a trend of all commercial examples. All styles have a certain alcohol content, flavor profile, etc. But what about Saison? What, if any, commonalities are there to the style? Well, if there is one common characteristic to the style it is the attenuation. Saisons have attenuations exceeding 90%. This lends a dry finish to a flavorful beer. And what is the flavor? That depends on the beer. Saison Dupont is a very bitter yet fruity example. Saison Papaix is more dry with a mineral edge. Fantome is less fruity but more of a lactic acid edge. Essentially, a Saison is a dry beer with a character unique to the brewery where it is made. Sometimes when you least expect it you run into something that changes your expectations. A couple of weeks ago Brad and I attended the Big Beers, Belgians, and Barleywine festival in Vail. If you’ve never been, it’s a very small intimate festival, lots of great seminars, and an eclectic mix of breweries and beers. I love festivals like this, it not only gives me a chance to recalibrate my palate with beers I’ve had before but to try new and experimental beers. I have to say I do have a bias, usually I hit the bigger breweries at the expense of the small guys. My friend and fellow Siebel graduate Jeff Albarella had just started working at Carver Brewing Company so we stopped by early to say hello. Jeff immediately told us we have to try the El Oso Agrio. That first sip was completely unexpected. This was no ordinary sour beer. The aroma was a strange mix of watermelon, calvados, wood, red wine, bourbon, and a whole lot of things I can’t begin to describe. The flavor is the same, sour but not over the top like many examples, more of an oak aged cellar quality but different than any sour beer I’ve ever had. Evidently, that beer started out as a Barleywine before some being put into barrels to sour sit on fruit. This took it in a whole new direction. Definitely a hidden gem I was happy to find.